Counties covered: Somerset, Cornwall, Devon and Dorset. Deer species present: red, roe, fallow, sika, muntjac. 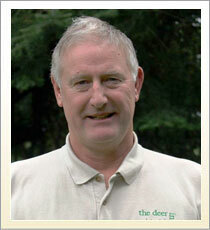 Key issues: The main expansion of deer populations having happened in the last twenty-five years. Prior to that deer had probably been absent in some areas since medieval times. The DI became involved in this region from 2005 and one of the first major projects was to build capacity in the monitoring and surveillance of bovine TB in wild deer. Here as in the rest of Britain, deer populations continue to increase in range and number, and the instances of deer-vehicle collisions is also increasing. The SW has recently been overshadowed by the spread of Phytophthera ramorum. There are serious implications for many tree species and the likely programme of clearfelling and restocking will be at significant risk from deer. The future management of deer within this area is reliant on stalkers and landowners working collaboratively with their neighbours to establish overall control of numbers. The Ancient Woodland Working Group has been the main focus for promoting landscape scale deer management in the area, under which run the "Exmoor Ancient Woodland Project’ and the Dartmoor ‘Restoring Ancient Woodland Project’. For the Dartmoor project the DI has been promoting collaborative deer management though supporting the development of a Deer Management Group, awareness days, and a series of talks on Best Practice. We have also helped the South West Forest develop a Deer management project modelled on the DI’s success in the West Midlands, and advised the Cotswolds AONB on deer management. The DI sits on various other working groups and committees including the SW Branch of ConFor, and the Quantock’s Deer Management and Conservation working group. In the Purbecks where there are serious deer impacts but management effort is patchy, lot of time is spent working closely with deer managers, landowners and the NFU to help agree ways to address crop damage and develop more collaborative deer management. We have also been helping the RSPB on the Isle of Purbeck to ensure sustainable deer management on the Arne peninsula. Working closely with partners and neighbouring landowners has included discussions with Natural England about using Higher Level Stewardship grants to fund deer management activities. The reserve is beginning to see an improvement in both the condition of the habitat and body weight of the sika. Deer may be susceptible to or may carry certain diseases of concern such as bovine tuberculosis (bTB), Bluetongue, Chronic Wasting Disease, tick/midge borne diseases and emerging zoonotic diseases. It is important to maintain a level of monitoring and surveillance, and to support research into disease prevalence, transmission and control. The Deer Initiative has assisted with disease monitoring and advice, including co-ordination and support of research projects. Following extensive surveys supported by DI in the Southwest, in November 2008 Defra published two reports on bovine TB in deer. The first is the final report from the South West England and Cotswolds Survey of Tuberculosis in Deer, the second is a related quantitative risk assessment of the risk posed to cattle by wild deer. The results of the deer survey show that on Forestry Commission land in the South West Peninsula, bovine TB is present at a very low level (less than 1%, except in one area where it is present at 3.8% in fallow). In the Cotswolds, high prevalences were found in two of the three areas sampled (15.9% and 8.1 %) particularly in fallow deer. In all areas surveyed, fallow were the species most likely to have the highest level of infection with M. bovis. The key results of the second report, the quantitative risk assessment, indicate that deer are likely to pose a lower TB risk to cattle than badgers throughout most of South West England and Wales. While bovine TB is not currently a significant risk in wild deer, deer stalkers and managers should take the disease risk into account when establishing any management programmes. Defra and the DI will be working together to share this information with the industry and to help inform future plans. Here as in the rest of Britain, deer populations continue to increase in range and number, and the instances of deer-vehicle collisions is also increasing. In 2010 we agreed a Highways Agency funded pilot project in the region, to investigate how deer may be encouraged to use existing bridges and underpasses for crossing busy roads. Dr Jochen Langbein is leading this work and we hope to be able to follow up with a practical trial to demonstrate reductions in deer-vehicle collisions.